Begin your travels in vibrant Istanbul, where East meets West on the banks of the Bosphorus. The capital of the great Ottoman Empire enjoyed more than four centuries of imperial patronage, which created one of the most famous skylines in the world. Then venture east to explore the fantastic otherworldly landscapes and cave churches of Cappadocia. End your journey through the highlights of Turkey with a stroll on Ephesus’ Royal Road to see what was once the world’s second greatest library. Upon arrival in Istanbul, you will be welcomed by your Cox & Kings local representative and transferred to your luxury hotel in the heart of the old city. The rest of the day is yours at leisure. After breakfast, depart with your expert Cox & Kings local guide to begin your exploration of Istanbul in Sultanahmet Square. Spend the morning on Seraglio Point, marveling at the 4th-century reliefs on the obelisk of Theodosius in the ancient Hippodrome. 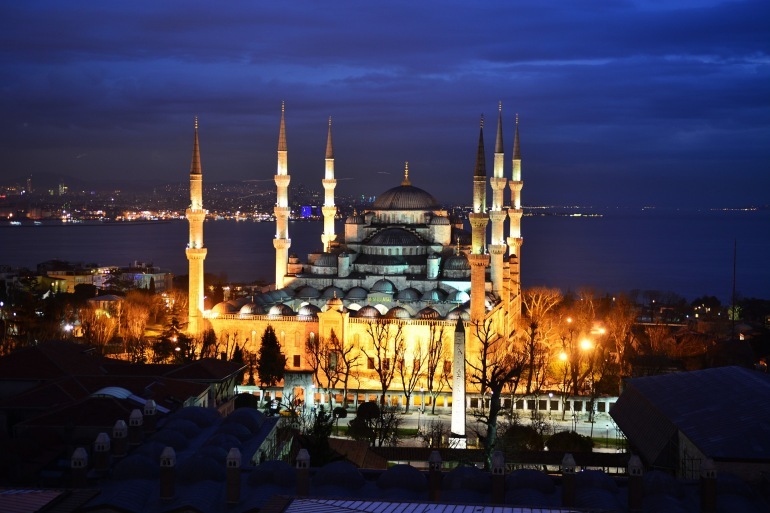 Then, stroll over to one of the city’s iconic monuments — the 17th-century Sultanahmet Camii (Blue Mosque). Nearby, examine the superb mosaics of the great church of Hagia Sofia, built in 360 by Emperor Justinian, as well as the Basilica Cistern, one of the first and largest cisterns in the city. Following breakfast, your journey through history continues at the legendary Topkapi Sarayi, the palace of the Ottoman sultans for over 300 years. In the heyday of the Ottoman Empire, the palace was home to as many as 4,000 people and contained mosques, a hospital and even a mint. Immerse yourself in the opulent world of the Ottomans for the rest of the morning. This afternoon, bargain with friendly shopkeepers at the spice, craft, food and carpet shops of Istanbul’s Grand Bazaar, one of the world’s oldest markets and destination of travelers for hundreds of years. Fly east to the fascinating region of Cappadocia. Upon arrival, drive to Kaymakli, the extensive underground city. Then, ascend to the top of Uchisar Castle for stunning, panoramic views. As you travel through Cappadocia, take time to stop and gaze for a moment at some of the world’s most marvelous landscapes. The deep valleys and towering rock formations have been slowly eroding to create the unique “fairy chimneys,” which in turn have been hollowed out by people to create homes, tombs and churches in the rock. Embark on an exploration of Goreme National Park with its cave churches and monasteries. Continue to the Ihlara Valley and the Selime Monastery, the largest monastery in Cappadocia. During the 13th century, monks settled in this cave and began carving out the kitchen, living quarters and church that we see today. Don’t miss the elaborate frescoes created hundreds of years ago. Fly southwest to Izmir and then drive up into the scenic hills before arriving in Sirince. After checking in to your hotel, relax for a while on the terrace, which overlooks the picturesque village. Then, perhaps enjoy a walk in town and immerse yourself in the age-old traditions of Turkish country life. This evening, you may like to dine at your hotel or venture out into the village to enjoy a dinner of local delicacies at one of Sirince’s popular restaurants. After breakfast at the hotel, explore the Greco- Roman archaeological site of Ephesus, which flourished as a prominent city and seaport between 600 B.C. and 500 A.D. Walk along the Royal Road, a 4th-century white marble chariot thoroughfare, whose most striking sight is the two-story Library of Celsus. Uniquely beautiful, with its restored façade, now the famed symbol of Ephesus, the library once housed 12,000 scrolls of papyrus manuscripts, making it the second largest in the ancient world after the library in Alexandria. As you continue along the Royal Road, your private guide illuminates the history behind some of the ancient city’s major buildings, including the Ephesus Theater and the Terrace Houses, which are currently undergoing excavation. After a traditional Turkish lunch, visit the House of the Virgin Mary, a lovely chapel set in the hills behind Ephesus. Today, you will be transferred to Izmir airport for your onward flight.